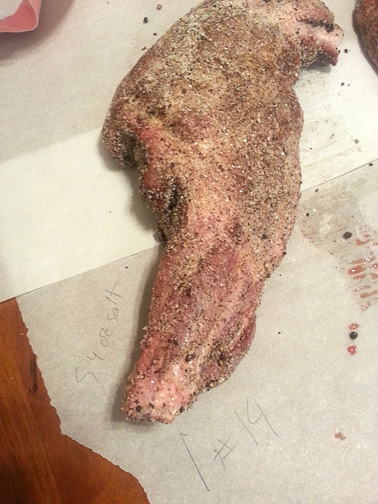 charcuterie | Have YOU Ben Starr Struck? WARNING: Working with electricity is dangerous. 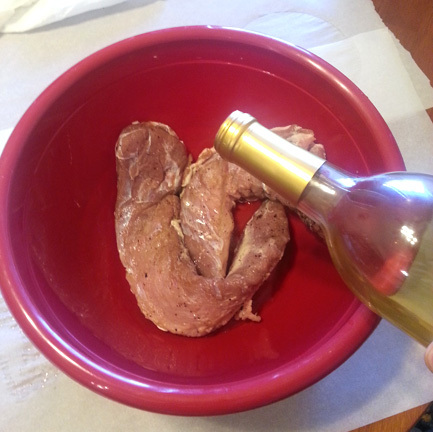 This article will teach you several ways to convert a refrigerator into a chamber for curing meat or for aging cheese. 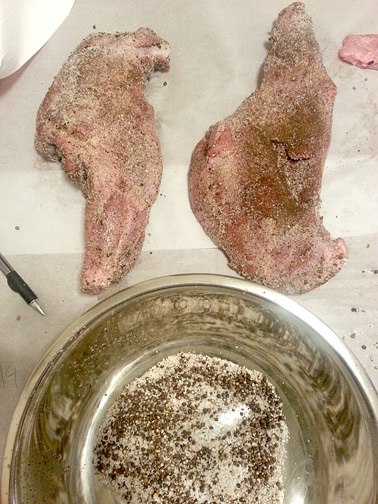 (The same principles can be used to convert a refrigerator into a lagering chamber for making homebrew lager beer, or converting a chest freezer into a kegerator.) If you choose the route that requires wiring, I cannot be held responsible for any damage to life or property should your wiring fail. If in doubt, consult an electrician, and always obey local, state, and federal electrical codes when modifying the electrical connection for appliances. 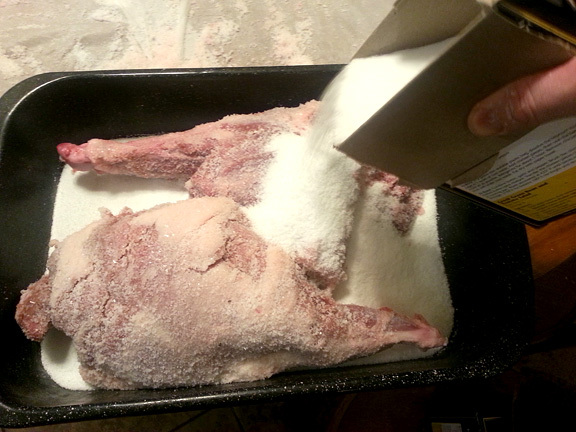 Folks with a basement or cellar anywhere in the US (or most temperate climates) generally have the proper temperature and humidity range to cure meat simply by hanging properly salted meat in that basement or cellar. (Though insects, mice, and wild molds can be a problem.) The finest meats in the world are cured in centuries-old basements in Europe. 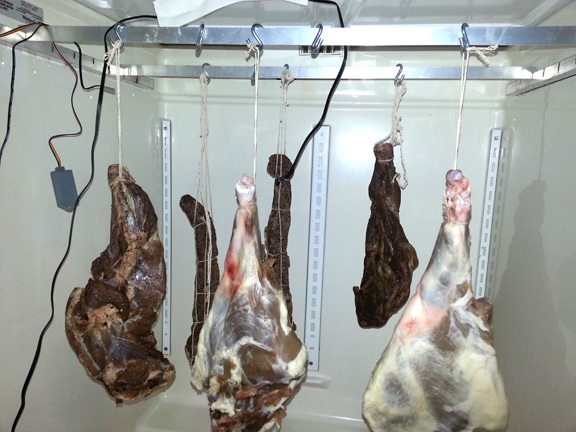 But for those of us without basements or cellars, curing our own meat requires a curing chamber that provides the ideal temperature and humidity range. I used a fast-setting epoxy to glue the square tubes to the walls of the fridge. (Make sure they are level and even with each other!) 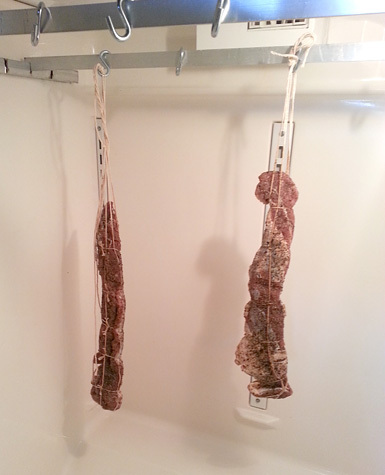 Then I just slid the bars into the slots, and placed some S-hooks over the bars to hang the meat. This type of rack is sturdy enough to cure full-sized hams. Wood may be easier to work with, but the conditions inside the curing chamber will be damp (around 65% humidity) which provides a perfect place for mold to grow, so I encourage you to avoid wood, if possible. Get creative! The first two items are available on the internet in a wide range of prices, depending on how convenient you want the conversion to be. The simplest units are plug-and-play. You plug the controllers into any outlet. You plug the fridge into the temperature controller and you plug the humidifier into the humidity controller. You set the proper temperature and humidity ranges, you place the sensor probes into the fridge chamber, and you’re good to go. Unfortunately, these units are the most expensive. 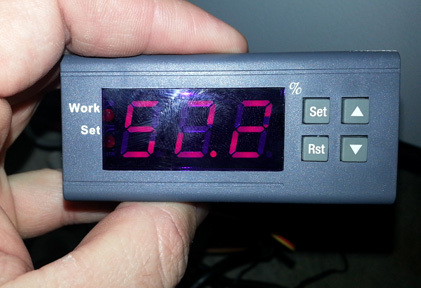 The plug-and-play temperature controllers range between $50 and $80, like this one on Amazon. The humidity controllers range between $50 and $100, like this one or this one. If you’re not accustomed to electrical work, I strongly encourage you to spend the extra money and get one of these. 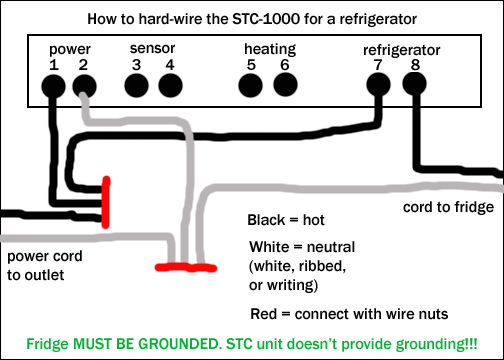 I’m going to explain how to hard-wire your fridge and humidifier directly to these units, because there are other articles out there on how to wire outlets to the units, and then plug in your fridge and humidifier. That’s extra cost, to me, and requires that I construct a housing to hold the units and the outlets. And I’m looking for the quickest route to efficiency. Please note that local electrical codes may not like you to have exposed wiring connections. You will need to buy or re-purpose a power cord to power the unit. The cord needs to be able to handle enough current to power the fridge, so don’t use a lamp cord! 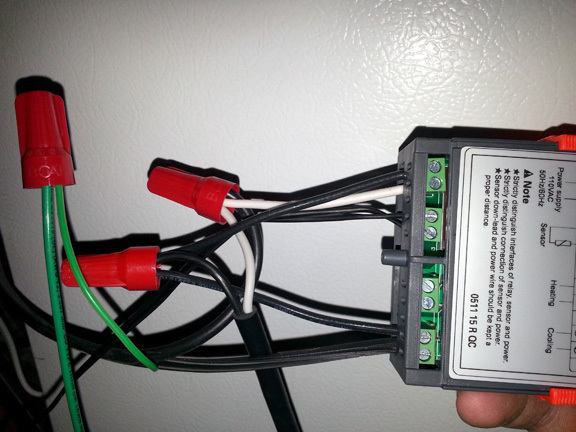 If you use a grounded power cord, you can connect the fridge’s green grounding wire to the green wire of the power cord. 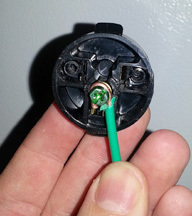 (If you use a 2-wire power cord, you will need to connect the green wire inside the fridge’s cord to the grounding screw on an outlet, or follow the alternate grounding procedure later in this post.) Using a grounded power cord is preferable. You will need to cut the plug off the refrigerator’s power cord and strip off the insulation from the hot, neutral, and ground wires. Some basic electrical knowledge here for those of you who are unfamiliar. A typical power cord contains a hot wire that carries the current to the device…a neutral wire that returns the current to the outlet, thus completing the circuit…and a ground wire that carries away dangerous electricity if there is a wiring failure inside the device, so that you don’t get shocked when you touch it. The hot wire is always black. The neutral wire is usually white…but if there’s no white wire, the neutral wire will be indicated by writing, markings, or ribbing along the cord’s insulation, so look or feel closely to determine which wire is the neutral wire. The ground wire is either bare copper or green. 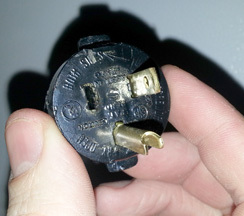 Here I've removed the first prong from the plug. After removing the other prong, I attach the ground wire from the fridge to the grounding screw. I replaced the back of the plug and now I have a ground wire that plugs into an outlet, but draws no power, it simply grounds the fridge. Now you need to plug in the power cord to an outlet. (I bought a special extension cord that has 4 outlets on the end that will sit next to the fridge. 4 items will need to be plugged into the outlet. You can also use a regular extension cord and a power strip.) The STC-1000 unit will power up, and now you need to set it. Make sure to attach the temperature probe to slots 3 and 4 on the unit. Then run the sensor probe into your fridge and make sure it’s not touching the walls, the racks, or the meat. 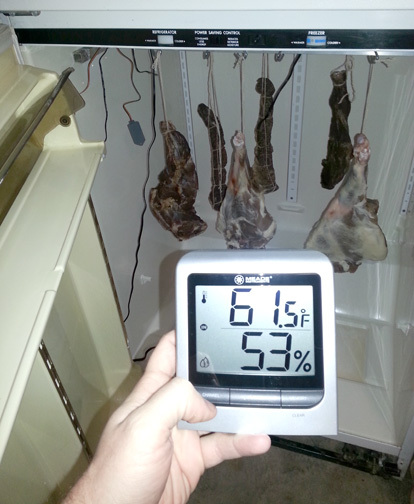 Now the STC-1000 unit will keep your fridge in the low 60s…the perfect temp for curing meat. 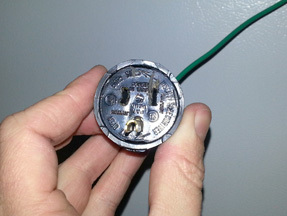 The hot wire from the power cord connects to two pigtails, which are connected to slots 2 and 3 on the WH8040. The neutral wire from the power cord connects to a pigtail to slot 4, as well as the neutral wire from the humidifier’s power cord. And the hot wire from the humidifier connects to slot 1. 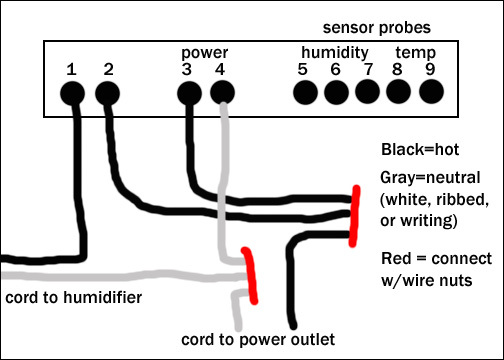 The WH8040 has 2 probes that it uses to calculate humidity…a temp probe which connects to slots 8 and 9, and a vapor probe that connects to slots 5, 6, and 7. Run the probes into the refrigerator’s chamber, and like the temp probe, they should hang freely in the area where the meat does. The following paragraph details instructions for setting the WH8040, you can skip this unless you are actively setting the device right now: Press and hold the SET key for 3 seconds to enter the setting mode. The first value is HC, which tells the unit whether to dehumidify, or humidify. Press the SET key again, and use the up or down arrows to set this value to H (humidify). Then press the SET key again to save the value and return to SET mode. Press the UP key to move to the next value, D, which is “Hysteresis.” Leave this at its default setting. Press the UP key again to move to the next value, LS, which is the lowest humidity range you want to keep. Press the SET button and adjust this setting to 55%, or whatever the lowest humidity is acceptable for you. Then press the SET button again. Use the UP arrow to move to the next value, HS, which is the maximum humidity. Click SET and use the arrows to set this limit to 65%. The remaining settings can be left at their defaults unless you need to modify them later. 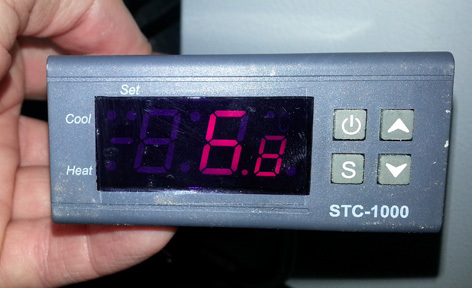 CA is humidity calibration…if your unit isn’t measuring the humidity correctly, you can override the settings by plus or minus 5%. PT is the delay time between turning your humidifier on and off, and the default is set at 1 minute. Press the RST key to leave the set mode. 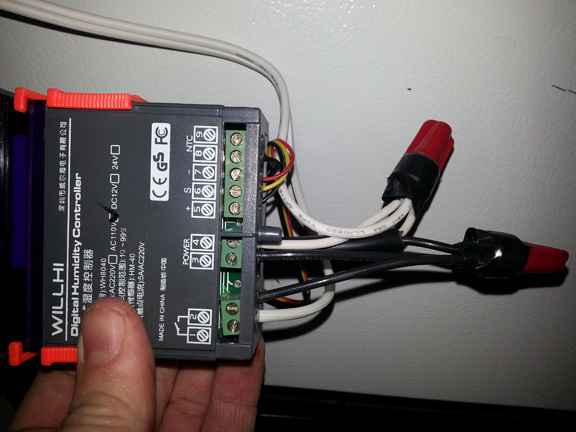 Now you can mount your WH8040 to the side of your fridge with double sided tape or velcro. Again, if all that wiring sounds too complex for you, you can simply buy a plug-and-play temp controller and humidity controller, you’re just gonna spend an extra $75-$100. Do that, and your system will be set up in 15 minutes. 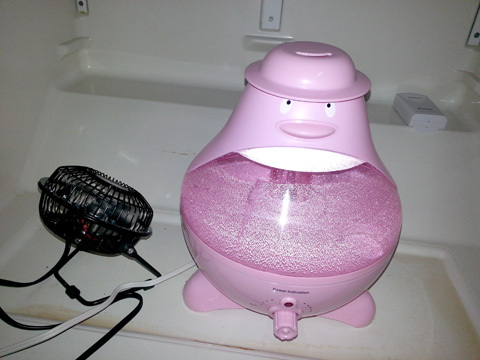 Now it’s time to place the fan in the bottom of the fridge next to your humidifier. I got a small metal desk fan on Amazon for $13 that was well reviewed. 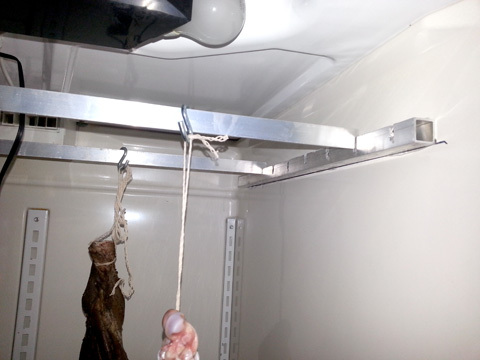 The air inside the curing chamber needs to circulate constantly to help dry the meat, so just run this cord out the back of the door and plug it into your power supply. The final step is to install your thermo-hygrometer, which keeps track of the temp and humidity inside the chamber, so you know if your controllers are working properly. I got mine on Amazon for $18. It has a wireless remote unit that I velcroed to the inside of the fridge. It is battery powered, and sends the information to the main unit, which I velcroed to the fridge door. Note the sensors all hanging on the center and upper left side of the pic. The freezer above is now empty space. And in MY converted fridge, the freezer maintains a temp of about 50 degrees, when the main chamber is 65. 50F is the PERFECT temp for aging cheese! So I can age cheese AND cure meat in the same unit. 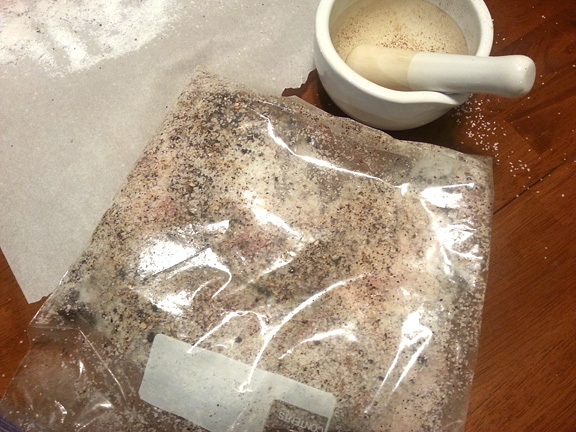 Don’t ever try to age cheese in the SAME chamber as curing your meat. 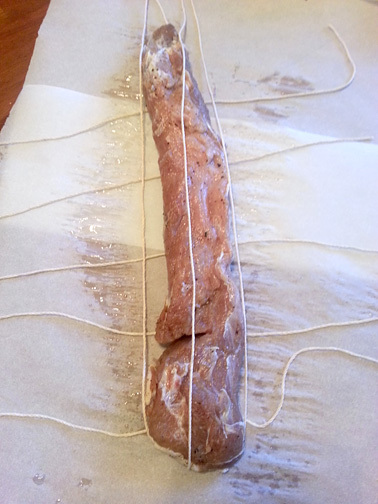 The bacteria that you inoculate cheese with (especially bleu cheeses) isn’t what you want growing on your meat. So they need to be separated. All-in-all, this setup cost me about $200. Not cheap by any means. 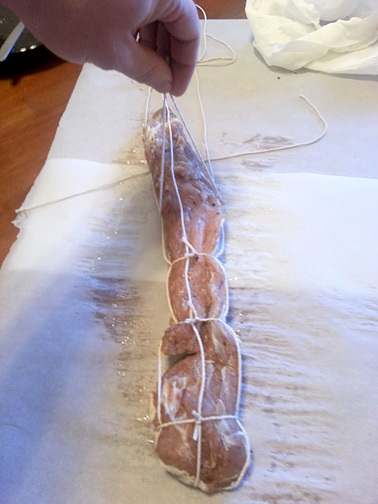 But if you’re serious about making your own charcuterie and salumi at home, this is money well invested. (A single Iberico ham or Prosciutto di Parma can set you back up to $1000!) Some people have luck using a small college dormitory fridge, moved to the warmest setting, with a dish of water in the bottom to boost humidity. This is way cheaper and easier to set up…but you lose control over your environment, which will yield unexpected results. 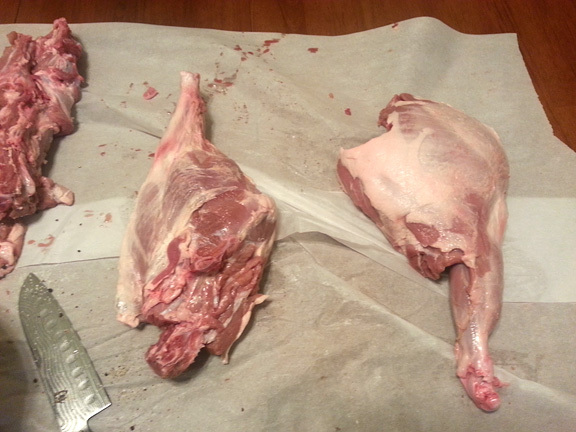 And if you’re going to great lengths to source quality meat, you don’t want it rotting away in your garage. 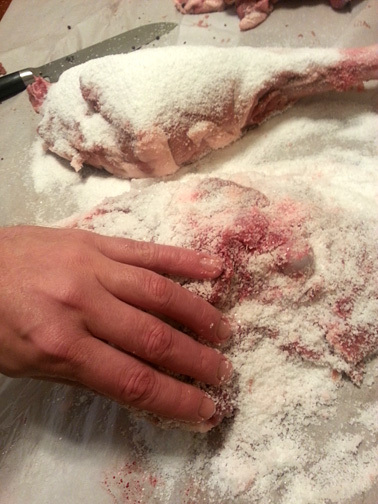 Now you’re ready to make prosciutto, coppa, spalla, guanciale, salami, and age your own hams. Of course, that’s an entirely separate blog entry. Check this out for starters! A video will be posted soon, which may help those who are more auditory and visual. 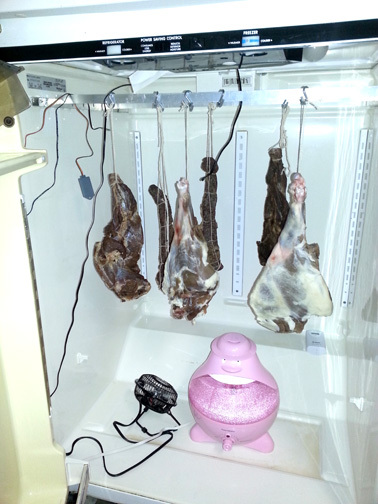 Please feel free to comment below, especially if you already cure your own meat at home, if you have a different setup, or if you make this setup and try it. And subscribe to my blog in the upper right corner of this page below the header image so you don’t miss out on other great posts!